Not only is Lake Ohrid one of Europe’s deepest and oldest lakes, it’s home to a unique aquatic ecosystem which boasts over 200 native species – it’s small wonder the lake has gained worldwide importance as a UNESCO World Heritage Site. 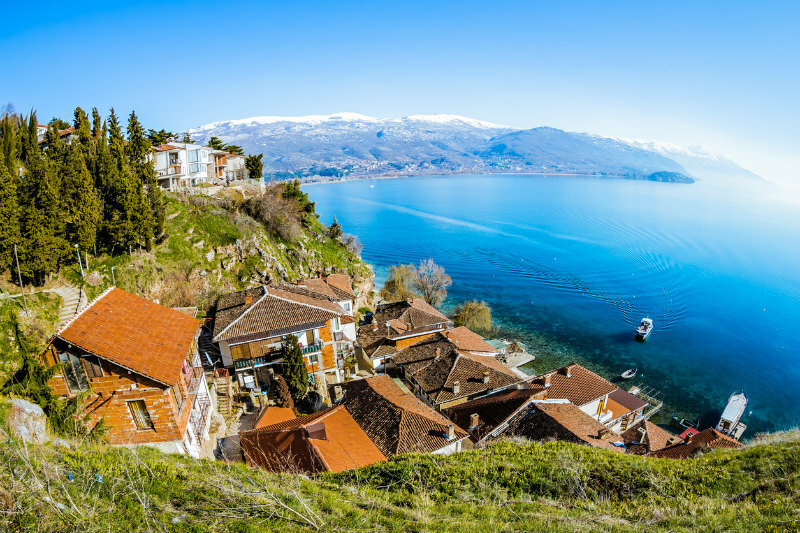 When on your travels in south western Macedonia, there’s plenty of opportunity to wander around Ohrid’s handsome lakeside towns, as well as spend lazy days at the lake’s shores. Wine lovers also love to spend relaxed evenings sipping fine vintages from grapes grown on the nearby hills. Ohrid is Macedonia’s former capital and as such offers many historical attractions. The site of the first Slavic university, the cathedral of St Sophia and ancient churches, Ohrid is also famed for its ancient fortress dating back to 997 AD, the walls of which still survive to provide a magical venue for summer concerts. A major draw for visitors is the charming ability to absorb history within an abundance of historic monuments one moment, and sit at the lake’s shores, water lapping at your feet another. The atmospheric old town cascades down a graceful hill, packed with beautiful churches and crowned by the remains of a medieval castle. It’s best experienced by wandering through the cobbled streets, stopping off at the traditional restaurants and not too touristy lakeside cafes. In July and August, the beaches are at their most popular and you might well want to cool off after a busy few hours sightseeing. Ohrid Boardwalk and City Beach are popular places to bathe or take a stroll across the boardwalk towards the rocky beaches and the small, beautifully located bars and restaurants, backed by cliffs. The boardwalk is lit by night by the pretty house-shaped street lights you’ll see in town. If you’d rather not walk both ways, hop on one of the taxi boats from Kaneo church back to the port. Usually the further you travel from Ohrid, the more scenic the beaches. Each lakeside beach is unique in the crowds they attract, be it young party goers, families, or those seeking quiet seclusion. Labino is a small, un-crowded, pebbly beach with clear, refreshing waters. Ljubaništa, on the south-eastern side of the lake near the border with Albania, is sandy and long giving ample space for large crowds. Many people turn up after 6pm to enjoy the unforgettable sunsets. 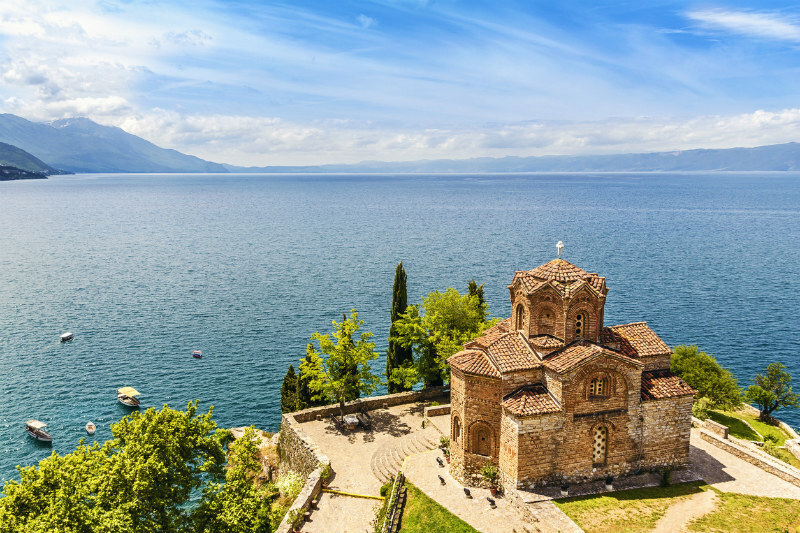 Arguably Ohrid’s most photographed site, this impressive 13th-century church dominates a dramatic cliff overlooking the lake. Reach it by walking about fifteen minutes west of Ohrid’s port area and peer down into the azure waters – you’ll soon see why medieval monks found such spiritual inspiration here. Small motor boats cluster beneath the church at the base of the cliff, waiting to whisk you back up the harbour. A beautifully preserved merchant’s house dating back to 1863 is the stunning location of Ohrid’s National Museum. The building itself is popular due to its splendid architectural style, so much so that it’s considered to be an old architectural masterpiece of Ohrid. The top two floors of this creaking timber building display Roman archaeological finds including a 5th-century golden mask found in Ohrid and locally crafted wood carvings, while the ground floor hosts a variety of art exhibitions. Just across the road, you will find a further part of the museum dedicated to an ethnographic exhibition. From 12 July to 20 August, you can take part in the fun of the summer festival. One of the biggest cultural events in Macedonia, the festival features opera and classical concerts, dance and theatre staged at various venues all over the city, including the beautiful Classical Amphitheatre. You will notice a distinct international flavour during the festival, due to the large number of leading musicians who come to perform here from across Europe. If you are visiting Ohrid in the second half of July, you will be able to witness the world’s swimming elite gather and swim approximately 30 kilometres along the lake to Ohrid’s harbour. The marathon starts at the monastery St. Naum and is internationally recognised by the World Swimming Club under the patronage of The World Swimming Association’s FINA. For the past thirty years, this festival has always presented an abundance of original songs and dances from the region’s folk culture. More than simply a small local event, this festival is now a respected member of the UNESCO Association of The International Council of Organizations of Folklore Festivals and Folklore Art, as well as The International Organization for Folklore Art. Heading to Macedonia? Consider European Travel Insurance.